There’s no denying that the trend for fully electric cars is spreading like wildfire throughout the auto industry. And it should be. Living with and owning an EV is a smart, efficient way to commute on a daily basis. There’s no denying that the trend for full-electric cars is spreading like wildfire throughout the auto industry. And it should be. Living with and owning an EV is a smart, efficient way to commute on a daily basis. And while there are some pretty amazing options out there, we’re pretty sure the coolest and most awesome one has just arrived care of Chevrolet: the all-new Bolt EV (apologies to its older brother, of course). How does the 2017 Chevrolet Bolt EV set itself apart from other EVs currently on the market? This sharp-looking little hatchback has the looks first and foremost. Borrowing heavily on the Volt’s exterior design, the Bolt manages to take that look and refine it, modernize it, and make it that much more appealing. Don’t worry though, there’s more to the 2017 Bolt than just curb appeal (though we know how important that is). Smooth lines flow from nose to rear in a way that Chevrolet design engineers describe “defying the wind.” Low-rolling resistant tires only help that free flowing, floating sensation you’re sure to feel as soon as you get behind the wheel. But it’s not all gentle breezes, as the Bolt EV also has a sporty side with aggressive wheel arches and a heavily expressive front end that’s full of character and personality. This little hatchback definitely doesn’t look like your conventional electric vehicle. Despite carrying a battery inside, the 2017 Bolt EV offers up a staggering amount of interior space; fold the rear seats flat and you’re looking at a total of 1,603 litres. There’s seating available for five, as well as a large full-colour display screens in the centre stack (10.2” standard) and one behind the steering wheel that ensures all necessary information is transmitted to the driver and passengers. 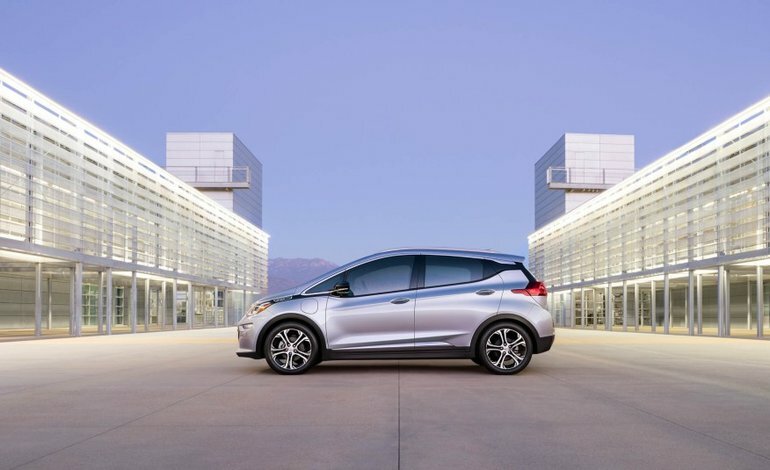 Display your Apple CarPlay or Android Auto connection or real-time battery life information, or use the available 4G LTE Wi-Fi; your 2017 Bolt EV will do more than just save you money on gas, it’s all about keeping you connected and informed, as well. The 2017 Bolt EV’s permanent-magnet synchronous electric motor produces 200 horsepower and 266 lb-ft of torque. With a full charge -- that can take as little as 9 hours with a 240-volt charger -- the Chevy Bolt EV is estimated to travel up to 320 km. Despite being a small hatchback, there is so much to fall in love with. To find out more about the all-new 2017 Chevrolet Bolt EV, head down to your local Bruce GM Midddleton dealer to speak to one of our experts. And don’t forget to book a test drive when these hot little hatches arrive in the showroom later this year.